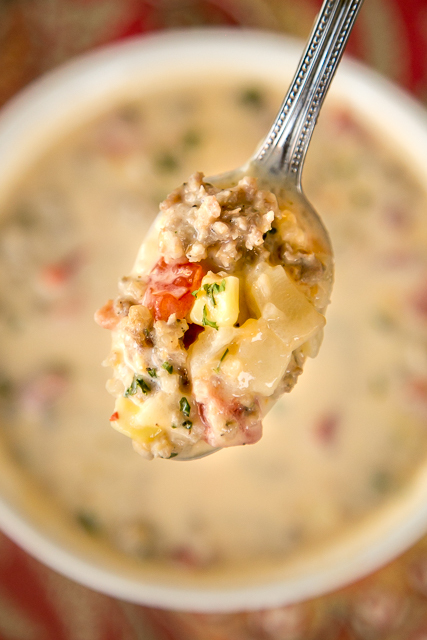 Cheesy Sausage Soup - ready in under 30 minutes! Sausage, chicken broth, diced tomatoes and green chiles, hash browns, corn, Velveeta and sour cream. Everyone LOVED this soup! Serve with some breadsticks for a quick and easy weeknight meal! 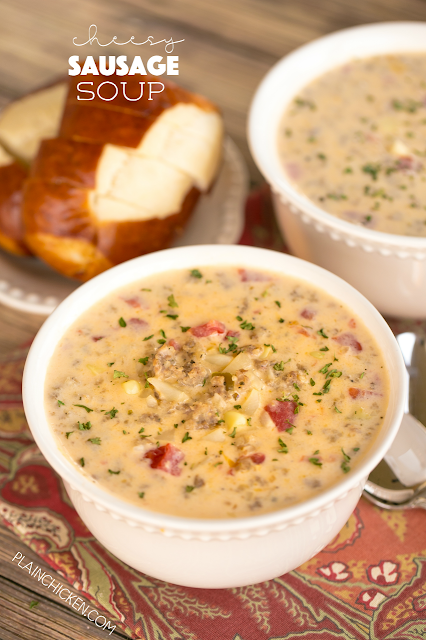 This Cheesy Sausage Soup is packed full of all of my favorite foods! Sausage, diced tomatoes and green chiles, chicken broth, corn, cheese, potatoes and sour cream. OMG! SO good! I made this for lunch and we both went back for seconds. Seriously delicious! This recipe makes a good bit of soup, so we ate this for lunch again the next day. Just as good! I used a package of Tennessee Pride hot sausage in the soup. Feel free to use your favorite brand of breakfast sausage. If you aren't a fan of sausage, you could substitute ground beef in this recipe. I think it would be fine. I prefer sausage, so that is what I use in this recipe. We served the soup with some pretzel bread from Trader Joe's. It was a fantastic easy weeknight meal! In a large Dutch oven, cook sausage over medium heat for 10 minutes or until sausage is browned and crumbly; drain. Add flour, and cook over medium heat, stirring constantly, for 2 minutes. Gradually stir in broth, diced tomatoes and green chilies, onion flakes, hash browns, and corn, and bring to a boil. Reduce heat, and simmer for 10 minutes or until potatoes are tender. Stir in Velveeta until melted. Stir in sour cream and serve. Do not boil the soup after adding the sour cream. Is part of the recipe missing? Look at the first paragraph. It says "stir in", but it doesn't make sense! Help!